•Keep “Don't forget your socks!”? •Keep “Pizza and Cake will be served”? Please note: This digital design is not created with actual glitter. The design was created with a glitter graphic that when printed will look similar to glitter. •We customize the digital item (shown above) with your info and you print! •We do not sell files you can edit, no proofs prior to purchase, & no blank templates. ★ IMPORTANT: All communication, as well as digital file delivery (via download link) will be done via Etsy convos/messages. Please check your Etsy convo notifications are ON. •Keep “Don't forget your socks!” wording? •Keep “Pizza and Cake will be served” wording? _viewing on smart phones, tablets, etc. By purchasing our digital product(s), you agree to our policies and to use our digital products for PERSONAL USE Only. The purchase of our digital product(s) does not transfer ownership of copyright. Our digital products (and/or items printed from our digital products) may not be shared, sold (no business use), copied, altered, or distributed in part or whole. Images/artwork may not be extracted. ► WHAT TYPE OF DIGITAL PRODUCTS DO YOU SELL? Our digital products are created using our original artwork and may include licensed elements (such as fonts, graphic design elements, and artwork), which we purchased and have a license to use. We customize the digital product (*except instant download items) with the info you provide and then we send a high resolution JPG (or PDF) for you to print. Files sold are for PERSONAL Use Only. INSTANT DOWNLOAD digital party printables are sold AS-IS, not customizable and not editable. ***Please Note: We do not sell files you can edit (no editable files), no proofs prior to purchase, and no blank templates. All PDF’s sold are password protected. Order after 5:00pm PST & turnaround time BEGINS the next business day. Orders processed in order received (*except Rush). We have a standard turnaround time to receive your digital proof in 48 hours or less (Mon-Fri, *excluding holidays,weekends) and for an additional fee, we offer a RUSH turnaround time to receive your digital proof in 24 hours (*excluding holidays). *A delay may occur if customization info is not provided, incomplete, or if order is placed after our normal business hours, the weekend or holiday. *Turnaround time does not include any additional time needed if changes need to be made after digital proof is sent. If needed, we will send a revised digital file usually within 1 business day or less (from time of request). ► JPG or PDF? WHERE WILL YOU BE PRINTING? JPG (one 5” x 7” digital invite): send to photo lab, email guests, print at home on matte photo paper or heavyweight bright white card stock. PDF (two 5”x 7” digital invites on 8.5” x 11” page with 1/8” bleed and crop marks): send to print/copy shop or print at home on heavyweight bright white card stock. *PDF files are password protected, can’t be edited, and may only be opened/printed in Adobe Reader (Download for free: https://get.adobe.com/reader/). Please let us know the EXACT size you’ll need (ex. Costco has a flat 5” x 7” size which is actually sized 5.125” x 7.25”, etc.) since some have non-standard sizing for JPG’s. Vista Print does not accept password protected PDF files. ► DIGITAL FILE DELIVERY (SHIPPING)? ★ IMPORTANT: All communication, as well as digital file delivery (via download link) will be done via Etsy convos/messages. •No physical product and/or no printed materials will be shipped. •Since you are purchasing a digital product, there are NO shipping charges. •If purchasing a digital product (not an instant download), we will send an Etsy message/convo with a download link. •Please check your spam/junk mail folder in case Etsy messages are placed inside this folder AND please be sure your Etsy convo/message notifications are turned ON. ► WHAT CAN and CAN'T BE CHANGED? 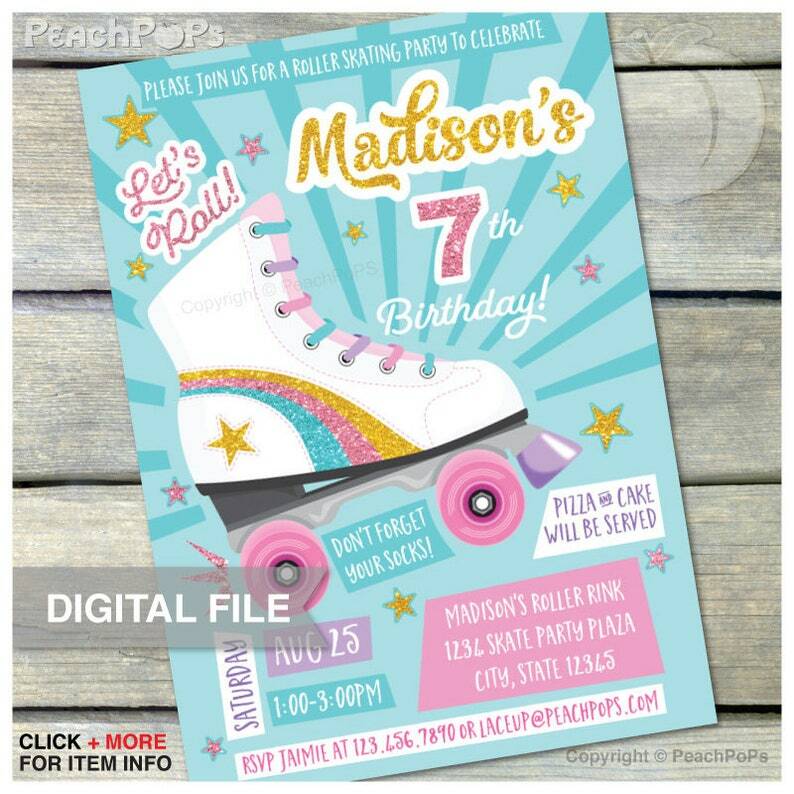 *INSTANT DOWNLOAD digital party printables are sold AS-IS, not customizable and not editable. We want you to be happy with your digital order! We do our best to proofread and if any corrections are needed, we will send a revised file. If an error is caught after file delivery, we will gladly resend a corrected digital file. *Once approved, customer is responsible for items printed at home or at a photo or print shop. *Please print a test print before printing up multiples from home/shop. ► MISC QUESTIONS: NO PRINTING, MOCK-UPS, ETC. ► DO YOU OFFER PRINTING? No, we're sorry, but we currently do not provide any print services as all products in our shop are digital products for you to print at home, a photo lab or print/copy shop. ► DO YOU PROVIDE MOCK-UPS or SAMPLES BEFORE PURCHASING? No, we're sorry, but we currently do not provide mock-ups or samples prior to purchase. When you print the digital file at home or at a print copy shop, please only print on bright WHITE heavyweight card stock/paper. ► VIEWING or DOWNLOADING ON MOBILE DEVICES? Please view and/or download on a desktop and/or laptop computer. ► HOW LONG ARE FILES KEPT? Please be sure to SAVE and backup your digital file to your desktop and/or laptop computer as soon as you receive your digital order. All completed/sent order files will be DELETED after a reasonable period of time due to our file storage space. Due to the digital nature and customization of our digital products, there are NO refunds or exchanges. However, in the event you are unhappy with your purchase, we do make exceptions, and we will do our best to find a solution. Please CONTACT US (via convo or email peachpops AT earthlink.net). Customer satisfaction is a top priority! Once downloaded, there are NO REFUNDS on INSTANT Downloads. We are more than happy to cancel your order if we receive the cancellation within 24 hours BEFORE any file has been sent OR downloaded. After 24 hours OR if any digital file has been sent OR downloaded, please contact us regarding cancelling your order, Thank you. By purchasing our digital product(s), you agree to our policies and to use our digital products for PERSONAL USE Only. Purchase does not transfer ownership of copyright. Our digital products (and/or items printed from digital products) may not be shared/sold (no business use, no resale)/copied/altered/distributed (in part or whole). No mass production. No public use. Artwork may not be extracted. Our sample images are not allowed to be used. Our digital products are designed by us and created using our original artwork and may include licensed elements (such as fonts, graphic design elements, and artwork), which we purchased and have a license to use. All artwork/designs COPYRIGHT © PeachPoPs™ PeachPoPsClipArt™. All Rights Reserved.